"Greetings Norman.....opened me goodies around 8pm tonight.....thank you for the extra pen as a gift!!! All of them are so nice. The Duke Golden Rings is really well balanced and writes so nice. The pearl panels looks so nice and writes well also. The jinhao General is a heavier pen but writes excellent!! The Croc outré is well made and looks really elegant. And finally the Baoer Arrow is great quality for the price...cap is a little difficult pulling off right now, but I AM sure it will wear in. I have lamy blue black in that one . The Duke, General and Croc have Sailor Jentle Blue Black in them. Pearl Panels has Quink Blue Black...Anyways, I still have about 20 more pens from you on the radar, but will have to hold off for now i think. I appreciate all your help...really have been enjoying your friendship and your website!! bye for now..God Bless..."
"I LOVE my Duke Golden Rings!!! It writes beautifully and my penmanship has definitely improved already...Already looking for another pen to use with a different colored ink. Then maybe more than one pen since there are so many great ink colors. Thank you again for your great service and rapid replies to my emails." "As I am making another order, I have obviously loved my previous purchases. The Duke Silver Rings has been a revelation. The ink flow is consistent and the nib is relatively smooth, although the page is still felt slightly. What makes this pen special is that it writes well on a variety of paper, even recycled copier paper. What I had purchased as a writing pen has become my grading and editing pen! 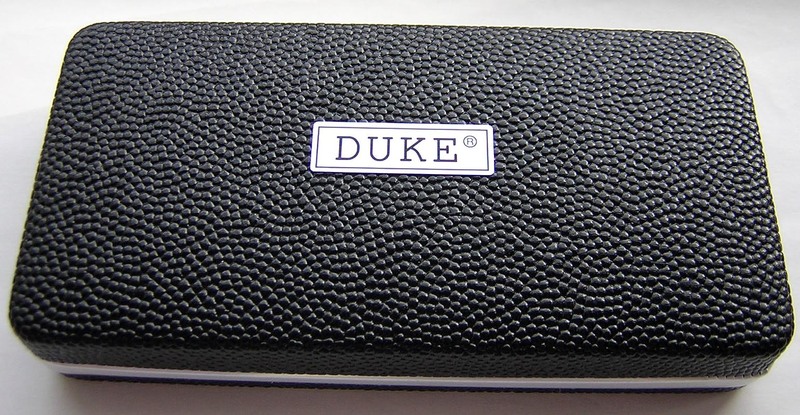 I look forward to trying more Duke pens. The Pilot 78G stub has already become my favorite script pen. It seems to work well with every ink I have tried so far. The flow and nib are spectacularly consistent even when writing speedily. The Monteverde Prima (M nib) is a wonderful writer. It lays a nice fine line without any feathering. It is slightly finicky depending on the paper chosen. It is perfect on my good papers, but does have some problems with stuttering on cheap legal pads and printer/copier paper. Thanks for the great work in adjusting the nibs! " "Received the pen. Love the weight of it and the feel of it in my hand. 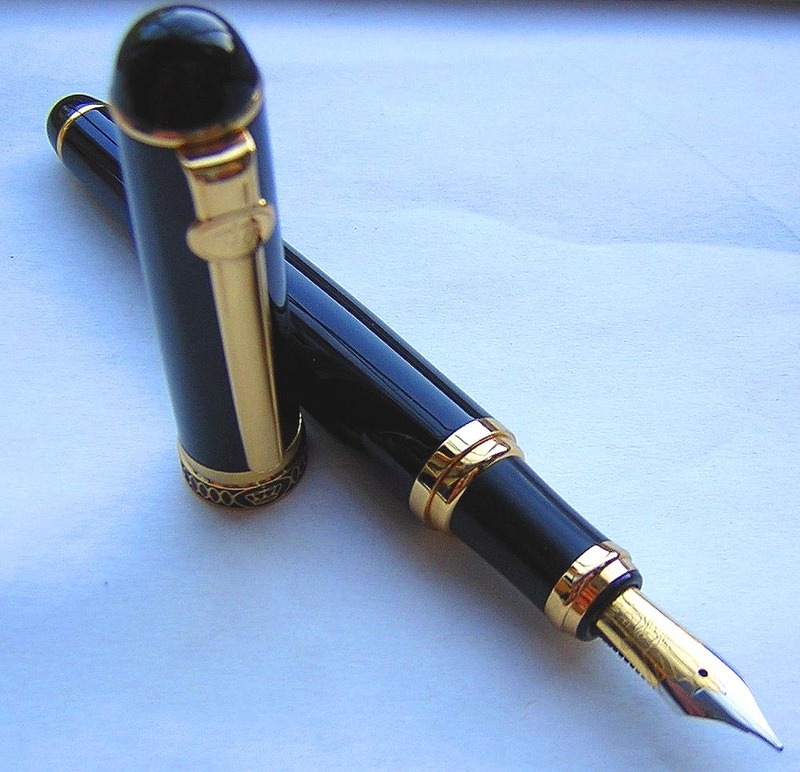 The ink flows so smooth and the fact I can buy such a excellent quality pen so inexpensively (avoiding the word cheap) is incredible and makes fine writing instruments available to the masses." "Hello Norman, Golden Rings arrived safely. Very well made and great value for money, I'm delighted with it." R.W., Glasgow, U.K. The Golden Rings classifies as an over-sized pen, measuring 5-1/2" capped and 6-1/4" posted, with a nice heft derived from its lacquer over brass construction. 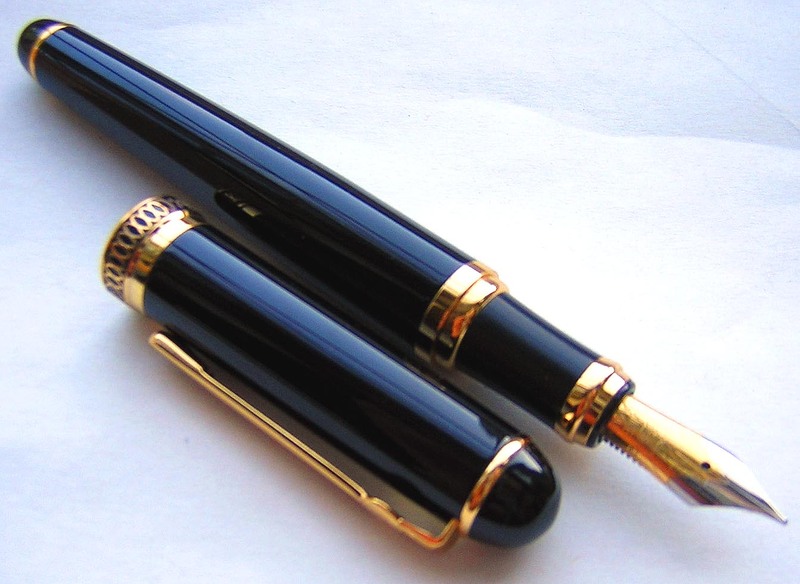 As much as I like the brilliant colors and patterns of many of today's resin pens, sometimes you just can't beat the classic black and gold fountain pen. Identical in construction to the Golden Rings, but finished in silver-tone highlights. 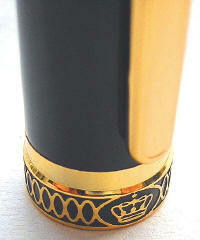 The gold-plated highlights of the clip, cap band and rings perfectly offset the high luster of the black lacquer. The clip bears the DUKE 'crown' logo, which is reprised on the cap band -- along with 'Duke' and a series of interlocking golden rings. The pen utilizes a slip cap, which re-caps securely with a noticeable 'click'. 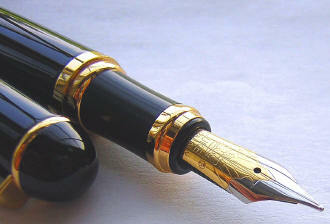 The two-toned steel nib, which I would describe -- like most DUKE nibs -- is a 'light-medium' in width. 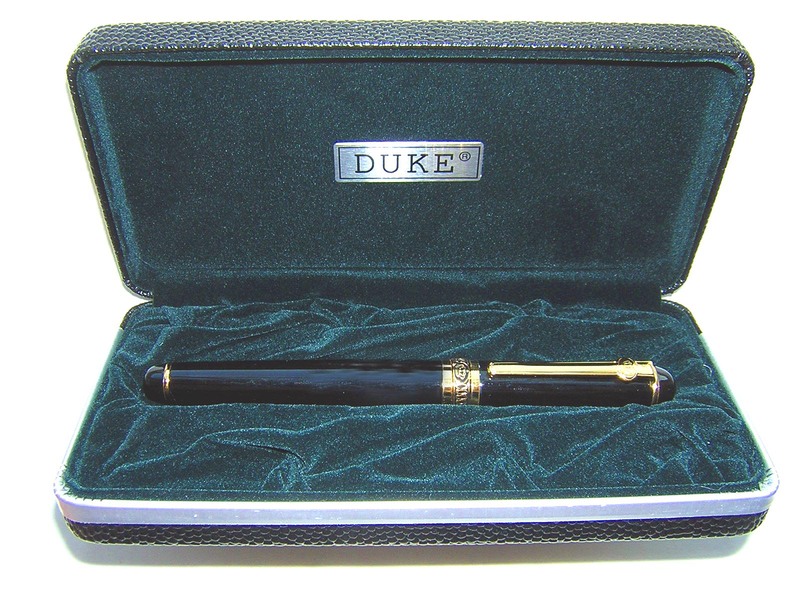 The nib itself reprises the DUKE 'crown' logo in its engraving, as well as 'Duke', 'Germany' and very attractive scrollwork. Unscrewing the all-metal fittings between the section and barrel reveals a rubber gasket for a tight fit, and a large capacity Duke piston converter for bottled ink. The pen comes boxed in a black, pebble-textured gift box. The Golden Rings is a terrific, classy-looking pen for the price.